A co-ordinated and targeted hard-left plot is underway to threaten and destabilise Jewish MPs and their supporters in the Labour Party, according to a report by the Jewish Chronicle. 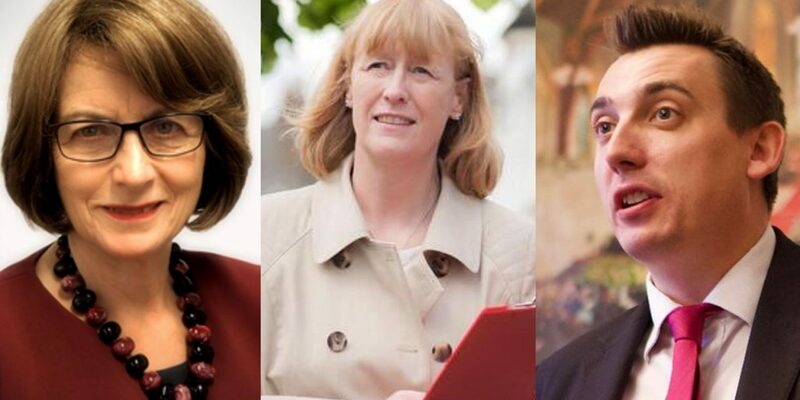 Labour MPs Joan Ryan, Gavin Shuker, Dame Louise Ellman, Luciana Berger, Rosie Duffield, Tulip Siddiq and Bill Esterton have received or are being targeted with no-confidence votes for having expressed concern over anti-Semitism or been supportive of groups such as the Jewish Labour Movement. Further to this police have been brought in to deal with an intimidation campaign with some MPs receiving threatening correspondence. In the wake of receiving no confidence vote last week in her Enfield North contituency, Joan Ryan called police after she and Gavin Shuker, another MP facing a no confidence vote after criticising Jeremy Corbyn’s handling of the antisemitism row, had “sinister” cards delivered to their parliamentary offices wishing them “good luck with the new career”. Officers from the Parliamentary Liaison Unit are investigating how an intruder was able to enter the office of Ms Ryan and place the card, which contained private details of her upcoming holiday to Cyprus, on her desk. The Jewish Chronicle has also learned that alongside the intimidation of Ms Ryan, moves are already underway to unsettle Jewish MPs such Dame Louise Ellman and Luciana Berger in their Liverpool Constituency Labour Parties. Non-Jewish parliamentarians such as Canterbury MP Rosie Duffield, Hampstead & Kilburn MP Tulip Siddiq and Liverpool Sefton Central MP Bill Esterton are now being targeted for having expressed concern over antisemitism or been supportive of groups such as the Jewish Labour Movement. Dame Louise, who has been the Liverpool Riverside MP since 1997 and was re-elected with a 35,000 majority at last year’s general election, has long been attacked by hard-left campaigners for her membership of both the JLM and LFI and her repeated efforts to stand up for the state of Israel. At a meeting of Liverpool Momentum group on July 31, the chair of Riverside CLP, Tim Hayden, called for a challenge to be mounted against his own MP, Dame Louise. He said: “It’s time for a change. MPs shouldn’t have a job for life — because there are MPs in this city campaigning to undermine Jeremy Corbyn. Last Friday night, at an emergency meeting of the Riverside CLP, activists again discussed replacing Dame Louise as their MP — and several spoke in favour of submitting a motion for inclusion at the Labour Party conference later this month, backing mandatory re-selection of MPs. In nearby Liverpool Wavertree CLP, where JLM parliamentary chair Ms Berger has been MP since 2010 and was re-elected with a 29,000 majority in 2017, left-wing activists attempted to force through a motion calling for the use of only the brief 38-word definition of antisemitism from the International Holocaust Remembrance Alliance (IHRA), and which called for “free speech” to criticise Israel as a “racist endeavour”. The meeting of Wavertree CLP took place on Tuesday evening — while the Jewish MP and other Jewish members of the local party were unable to attend because of Rosh Hashanah. But the hard-left faction were forced to ditch the motion after it became clear it was not in tune with that passed by Labour’s own ruling national executive committee (NEC) last week. Ms Berger has repeatedly been attacked by local activists over her Jewish background — but she remains popular among voters due to her energetic work on local health issues and initiatives as well as her campaigns to support local businesses. On Monday there was also an attempt by hard-left activists to force a no-confidence vote against Rosie Duffield, the Canterbury Labour MP, over her support for the Enough Is Enough demonstration in Westminster in March against antisemitism in Labour, and her appearance as a speaker at the Jewish Labour Movement’s conference earlier this month. The authors of the motion — which was eventually withdrawn after an outcry by moderate members of her local party — said that Ms Duffield, who is Canterbury’s first Labour MP, has involved herself with “groups and organisations that are campaigning to damage our Party”. On Wednesday night, Hampstead and Kilburn CLP was set to debate another hard-left backed motion calling for all Labour members to be “free to call Israel a racist endeavour”. The motion describes the IHRA definition of antisemitism as an attempt to “undermine racism by prioritising one form of discrimination above others”. Local MP Tulip Siddiq has repeatedly come under pressure from left-wing activists to change her stance on Israel and her close connection to the Jewish community. The JC has also learned that at a meeting of the Liverpool Crosby branch of Sefton Central CLP, an attempt was made to affiliate the local party to the pro-Corbyn Jewish Voice for Labour group that has repeatedly attempted to downplay allegations of antisemitism within the party. This was again on the night of Rosh Hashanah, when no Jewish activists or members would be able to argue against the move. The move to affiliate to JVL was proposed by far-left activist Mark Holt, from the Merseyside Stop The War group. A source who attended the meeting told the JC: “The motion could easily have gone through without much scrutiny. It was suggested by one person at the meeting that they should hold the vote on affiliation to JVL in December, at which Jo Bird, a JVL activist from Wirral could speak. The JC has previously revealed how Ms Bird sparked anger after complaining about the “privileging of racism against Jews” compared to discrimination “against black people, Muslim people and migrants”. It has also emerged that Robert Carter, who joined Labour during the 2015 leadership hustings, is now being investigated by Labour’s Compliance Unit after footage of the Enfield North constituency party meeting was broadcast by Press TV. All working journalists and film crews were banned from the event, in which Ms Ryan, parliamentary chair of the Labour Friends of Israel, narrowly lost the vote by 97 votes to 95.